Today did not start out well. I was having the WEIRDEST dream ever, and must have turned my alarm off during said dream, because when I actually woke up and figured out where I was, it was 6:15 am, and I had to be out the door in 15 min! ACK! I threw on some clothes, washed up, and put some food in containers and was out the door. I even made it to class on time, but had to wait until after class to dig into breakfast. Boy was I hungry! 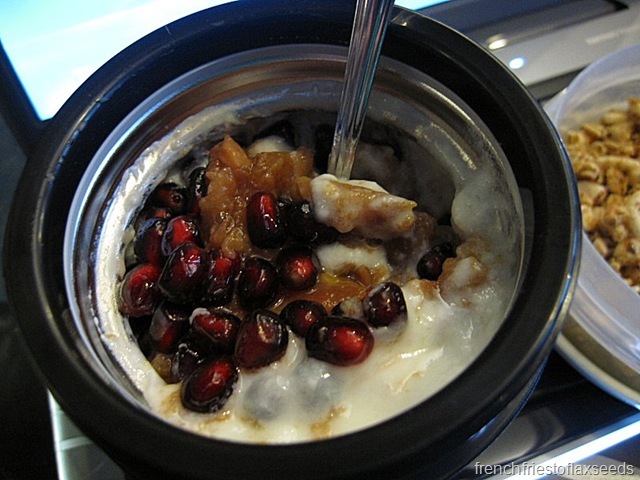 In the thermos I had yogurt, the last of the quince, and pomegranate arils. 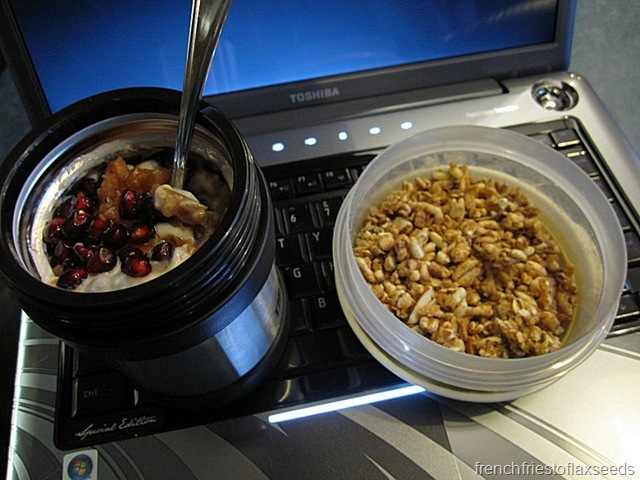 The other container was just some Kashi Honey Almond Flax cereal to combine with said yogurt & fruit. It was horrendous weather all day. It just rained, and rained, and rained. Good thing I had my new fancy boots – they kept my feet dry and warm! 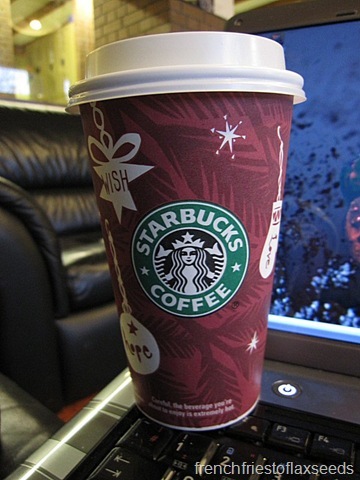 But to warm the rest of me up, I had to hit up the Sbucks. Do I even have to say what’s in there? My last volunteer shift at Agora later, and I was on my way home. First thing on my mind when I walked in the door? What’s for lunch? 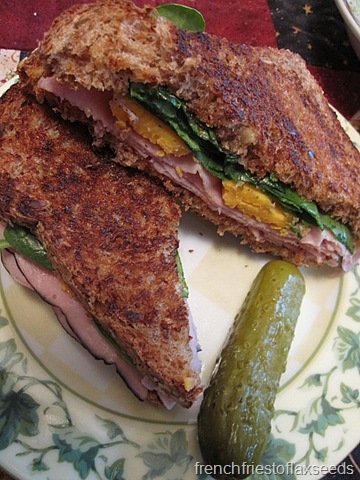 I made a grilled ham & cheese sandwich with baby spinach and red pepper jelly. Too bad my cheese didn’t want to melt. I also heated up a bowl of broccoli soup my sister had made on the weekend. 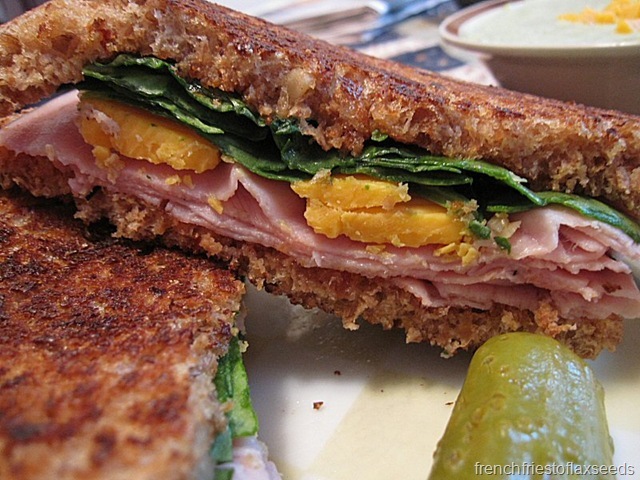 Topped with a little more cheddar. 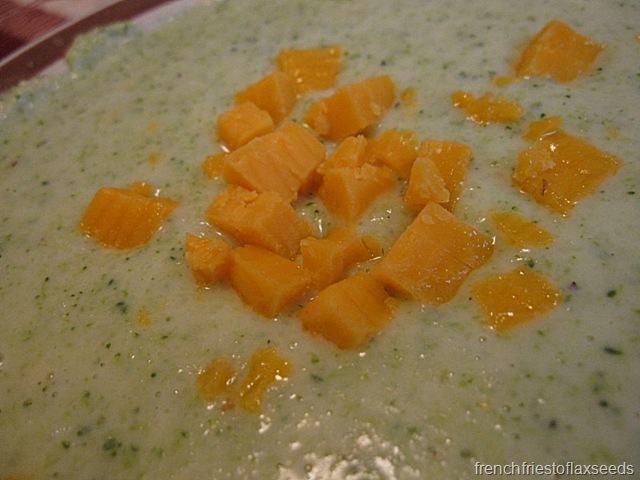 What’s better than broccoli & cheddar?! 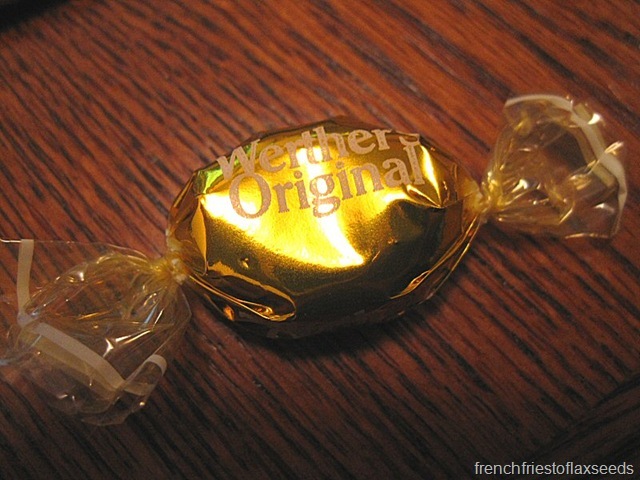 Rainy day food, for sure! I spent the afternoon at home, expecting an important phone call. Of course, my mom then ended up on the phone all afternoon, and we don’t have call waiting, so I figured they called and got a busy signal. But, low and behold, and 5 pm I received my call. Looks like I’ll be working with a dietitian on a project at Children’s Hospital. Alas, it is only volunteer, but still – it’s all about boosting that resume, right? Dinner was served way too early for my hunger, so I only had a bit. 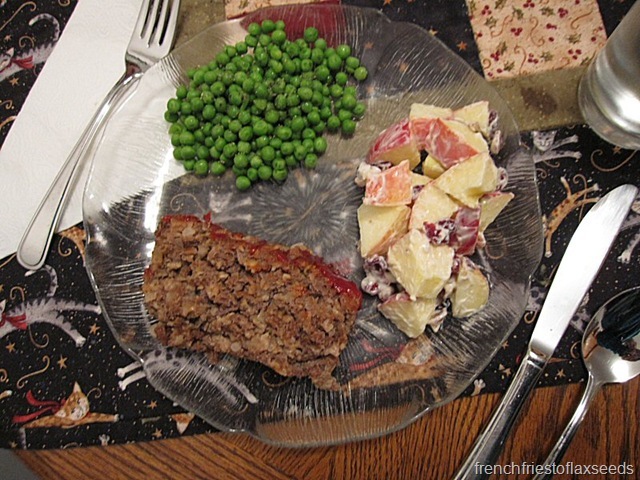 Meatloaf, green peas, and apple/craisin/pecan salad. There were baked potatoes as well, but I wasn’t feeling it. And wouldn’t you know it, all my close ups turned out poorly. So this is all you get! I made a quick trip up to the store to get a couple things (I was all out of good peanut butter), then had a sweat session with the dvd’s. Then it was time for me to satisfy my baking desires! I had a hankering for muffins. I thought oatmeal and apple should be involved. I searched out some recipes, decided on this one as my inspiration, concocted a variation in my head, then assembled the required ingredients. 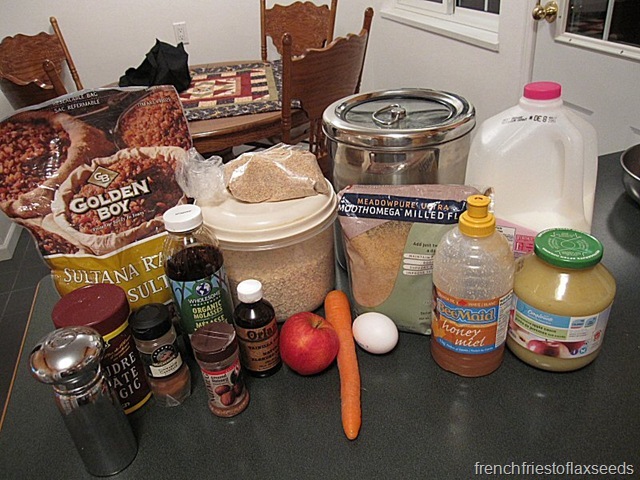 Combine dry ingredients (oats through salt) in a large bowl. 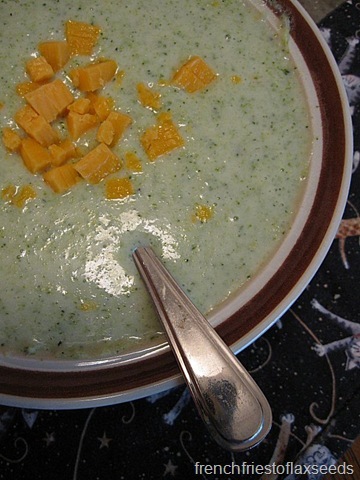 Combine wet ingredients (milk through vanilla) in medium bowl. 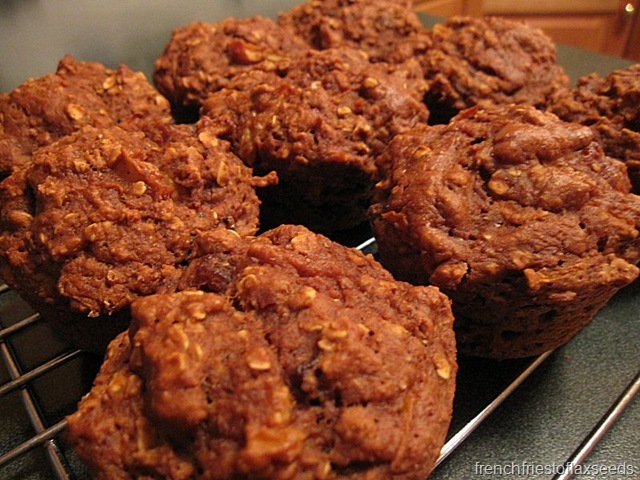 Add wet ingredients to dry, then add carrot, apple, and raisins. Mix until just combined – don’t over mix! (you know how muffins go). 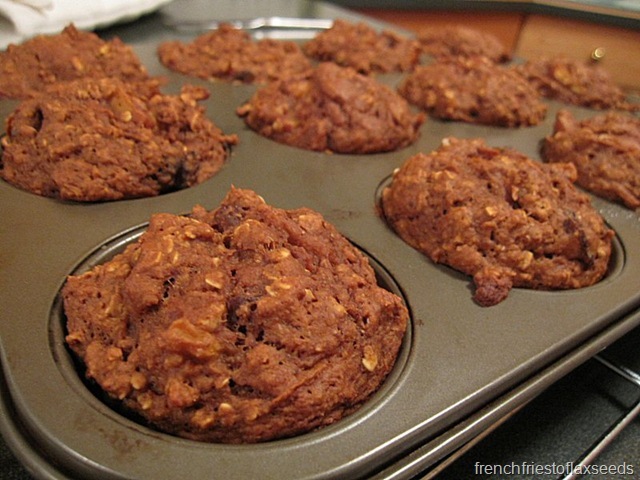 Divide equally between 12 greased or lined muffin cups. Bake at 375 F for 20 min, or until a toothpick inserted comes out clean. These turned out really well. I was a little worried that my wet to dry ratio would be off, but it was perfect. 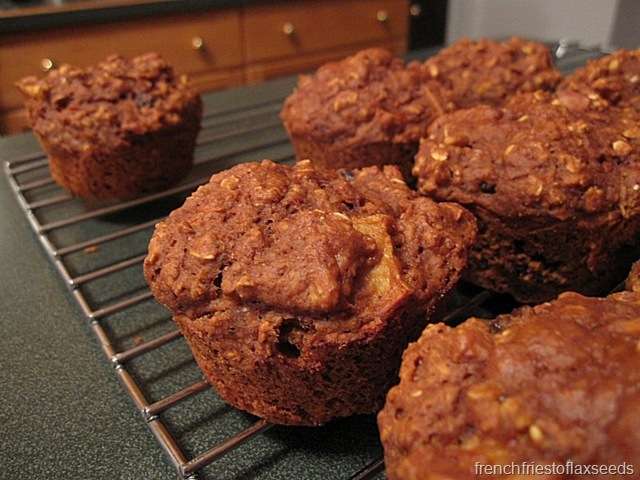 They are hearty, moist, slightly sweet, with a nice balance of spices. Both of my parents tried them out, and gave them the thumbs up. 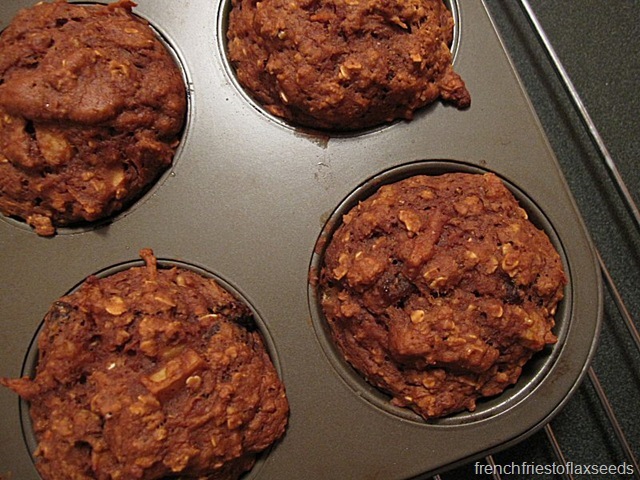 I think they would be a great breakfast muffin, pairing nicely with your favourite nut butter. 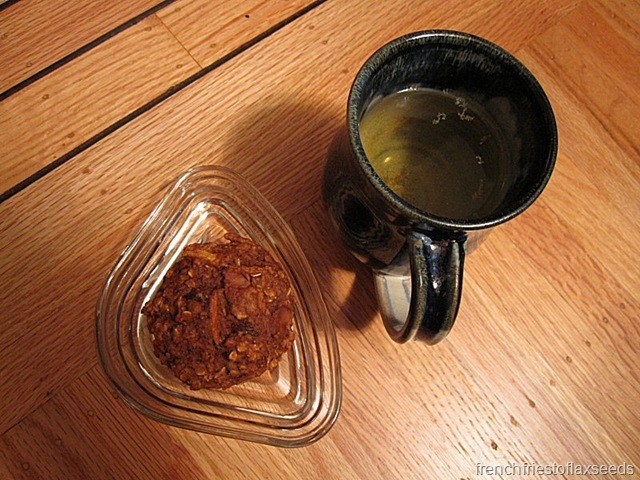 Obviously, I had one as my evening snack, with a another cup of chamomile tea. I still have another project on the stove, but it’s totally time for bed, so I guess I’m calling it done. I’m sure you’ll get to see it tomorrow. Night! I am so in need for some baking, I’ll try and make those muffins. 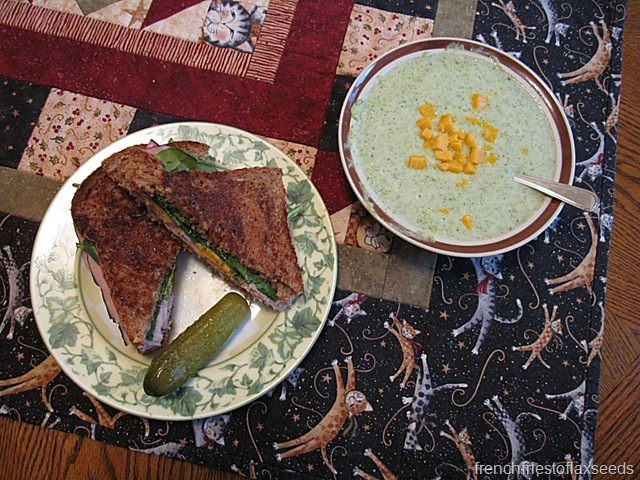 Soup and grilled cheese are practicaly required on raining days! Beautiful muffins!!!! I am definitely going to keep your name/blog in mind when I am searching for some baking inspo!!! The apple cranberry salad sounds soo good, and even though I just had a huge Thanksgiving meal, I am totally craving a ham and cheese sammy!!! YUM! Sorry bout rushing late with the alarm situation. I hateeeeeeeee having to scramble! !